New York, NY (April 27, 2013)-On Saturday, April 27th, the New York City Association of Hotel Concierges (NYCAHC) along with its corporate affiliate members and business associates celebrated Mayor Bloomberg’s MillionTreesNYC. This partnership with Mayor Bloomberg and the NYC Parks and New York Restoration Project (NYRP) took place in Alley Pond Park in Queens. 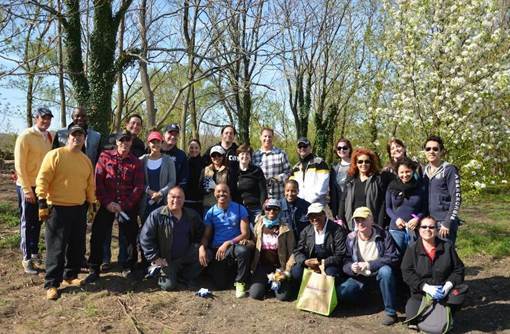 This year NYCAHC participated in the Spring 2013 Planting Day. After some on-site training, our volunteers truly dug deep by planting 2,000 native shrubs and sown with a mix of native herbaceous plants in Alley Pond Park for over three hours. In addition, NYCAHC donated $2,500 in support of NYC Parks and Recreation. The success of this year’s MillionTreesNYC initiative is once again greatly attributed to the talent, passion and participation of our concierge members and friends. NYCAHC thanks all of the volunteers-with special thanks to Six Stars of New York & Bermuda Limousine, who generously provided complimentary transportation to the event.